Malaria is one of the most dangerous travel diseases. Malarone ® protects against this sometimes fatal sickness. Each pill of Malarone contains the drug atovaquone 250 mg and the drug proguanil hydrochloride 100 mg. Together, these two drugs battle against one of the most dangerous diseases worldwide: malaria. How do Malarone malaria tablets work? 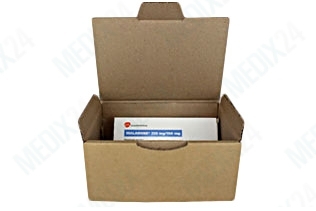 Malarone coated tablets contain the drugs atovaquone and proguanil. They are used in malaria prophylaxis, but also as a stand-by therapy. This drug combination is recommended especially for areas where resistances to malaria drugs have already been reported. The unique ingredient combination enables the use of the drug for malaria prophylaxis as well as for the treatment of malaria symptoms. Two days before you plan to travel, you start taking Malarone tablets once a day. You keep taking a tablet a day for a long as you are travelling and you continue until one week after you have arrived back home or in a country not at risk of Malaria. One of the reasons Malarone is a drug of choice for many travellers is that you only have to take it for a limited time. When you plan to stay in a country with a risk of malaria for over 12 weeks, please consult your physician about long term use. Only if a doctor considers it to be absolutely essential, Malarone tablets may be used during pregnancy and lactation. Interference with the operation of machinery or driving a car are neither known nor expected. 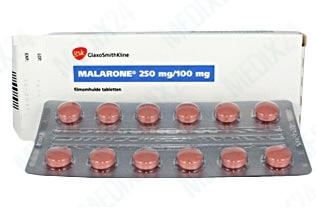 Malarone patients have, if any, weakened forms of the known side effects of antimalarial drugs. Some report a slight headache or nausea, abdominal pain or cough. Diarrhea and vomiting are rare side effects. 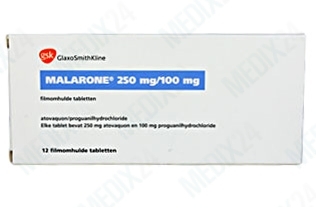 The effectiveness of Malarone may be affected by the simultaneous use of drugs such as rifampicin (tuberculosis), metoclopramide (drug for nausea) or tetracycline (antibiotics).